News | Crowlas & Ludgvan W.I. Camera Club went to Trevaskis Farm for their April Meeting, hoping to take photographs of the spring baby animals. The lambs were delightful, but the tiny piglets were hiding in their shelters out of the wind and rain. Next month is at Trevaylor Woods on May 10th at 1.30pm when the aim is to photograph the bluebells. See Helen if you would like to come along. 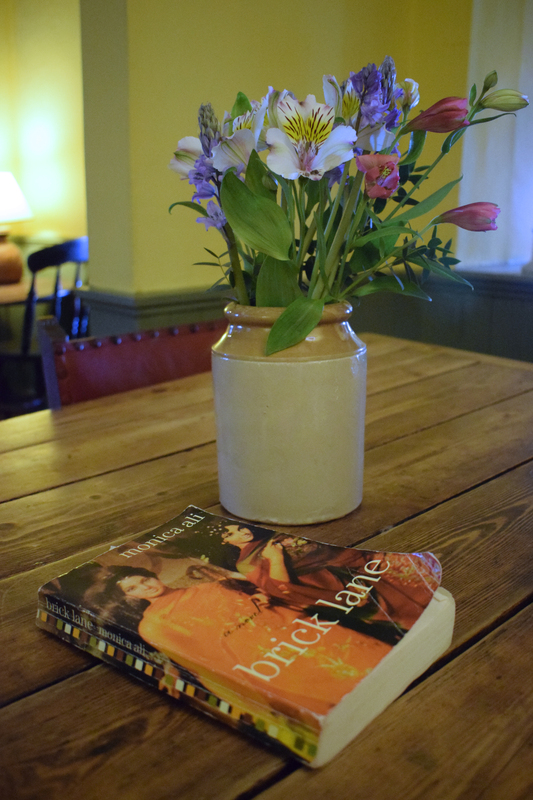 It was all change for Book Club in March. Instead of meeting at a member’s home they went to The Coastguard in Mousehole. The beautiful surroundings overlooking the coastal gardens were a world away from the inner city tower blocks and rural Bangladesh of the novel, which was Brick Lane by Monica Ali. The book scored highly, with eights and nines out of ten. Members particularly enjoyed the exploration of the two types of marriage that sisters Nazneen and Hasina embarked on; an arranged marriage for one and a love marriage for the other. Next month’s book will be ‘Normal People by Sally Rooney’. New members are most welcome. Despite the thick fog & mizzle it did not deter the walking group from the planned 5 mile walk from Mawnan Church to the Ferry Boat Inn along the Helford River. We enjoyed the views of Falmouth Bay, coast line & the wooded areas – very peaceful & beautiful. The Murley Hall was full for the Crowlas and Ludgvan WI Annual Meeting. Secretary Jan Bone gave a rundown of the past year, reminding members of the full and varied programme of activities on offer. President Alison Latham thanked members for their participation and expressed just how valued each and every one of them is. Particular thanks went to the committee and all those who have organise events over the year. A Treasurer’s Report was provided to all. Following a ballot Alison was re-elected as president for the year ahead. Two cups were awarded, the Competitions Cup to Hilary Turner and the Most Inspiring Member jointly to Jenny Birchall and Sylvia Ronan. Wendie organised a ‘getting to know you’ game for members to finish the evening off with a spot of fun. 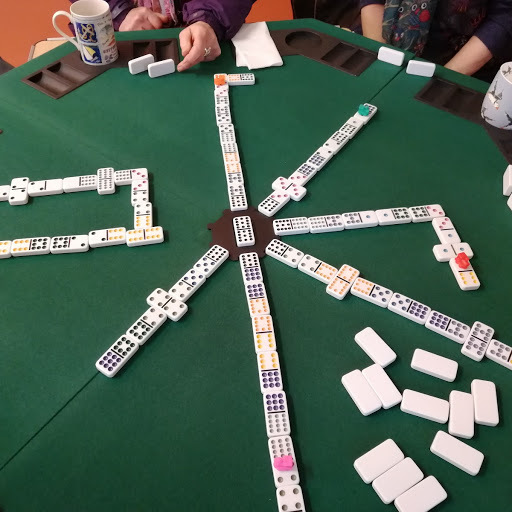 The Mexican Train! This new game has become a firm favourite at the monthly Board Games afternoon. Based on a 12 spot set of dominoes it is easy to learn and can be played by complete beginners and more expert players alongside. Why not come along to the next event on Saturday 13th April 2-4 pm and give it a go? Camera Club went to the RSPB Reserve at Hayle for their March Meeting. Unfortunately the weather was rather wet and windy, but members enjoyed watching out for the birds and seeing signs of spring. Next month’s trip is to Trevaskis where hopefully baby animals will be the subject. New members are welcome. See Helen for details. The Peppercorn Kitchen at Perranuthnoe was the venue for March’s Coffee Beans. 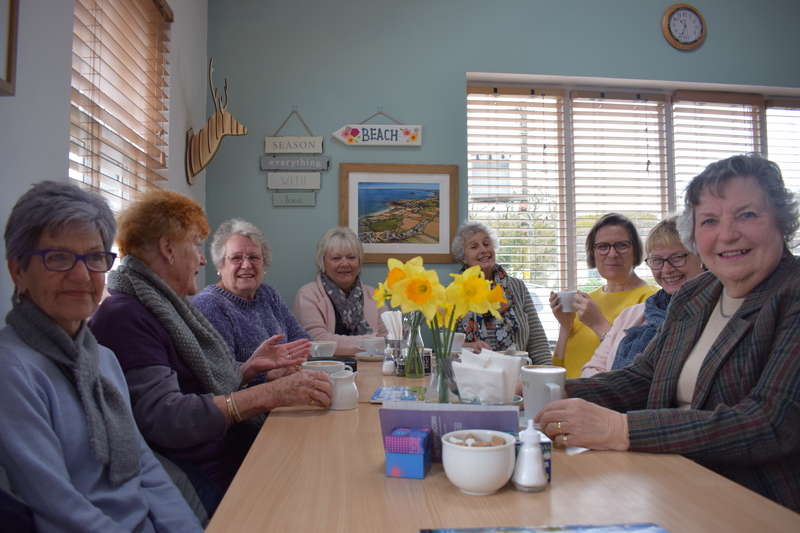 A cheerful group of members met for coffee and a catch up. If you would like to come along to the next one see Hazel at the Monthly Meeting for details.